As a kid, I remember making things like peanut butter and crackers for an afternoon snack. And, of course, fruit was always an option. I don't remember having as many portable and pre-packaged choices as we have today. The grab and go options were more limited to candy bars and cheap pastries. 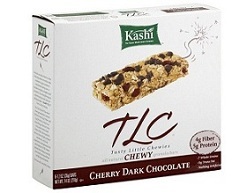 That's why I really appreciate things like Kashi's Tasty Little Chewies. These yummy granola bars come in two great flavors: Cherry Dark Chocolate and regular Chewy Granola. I have only tried the Cherry Dark Chocolate and let me tell you - they are fantastic! The combination of dark chocolate and cherry is a good match. Kashi products are really great because most have a whole grain blend of 7 grains such as oats, barley, wheatberries, etc, with just the right amount of sweetener (in this case wildflower honey) and a mix of nuts and dried fruits. So you are getting some nutritional bang for your buck. And the consistency of the bar and the packaging make them perfect for stashing in your bag until the hour of need. These bars have the 7 whole grains, sesame seeds, lightly sweetened red cherries and dark chocolate. Each bar has 3-4 weight watchers points plus and includes 4 g of fiber and 5 g of protein. It would be great if you would include a calorie count for items like this.